2. Last weekend, heaviest mortar and rocket attacks from Gaza in years. And more rockets and mortars today in retaliation for Israeli air force missile response yesterday which killed four people. 4. 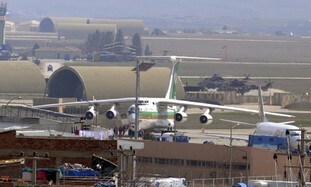 Grounding of an Iranian cargo plane (a huge Ilyushin IL-76TD) by the Turkish air force. This was the second plane grounded in the last few days. First plane had no contraband, but yesterday, the plane carried a large cache of weapons that was found hidden behind food cargo. The plane was bound for Syria. All of these events seem unprovoked, which leads me to speculate that this may be the beginning of the Third Intifada. Just as the Second Intifada took violence to another level from the First, it is likely that the Third will also take things up a notch. As in any warfare, the enemy adapts its tactics. In this sense, it may turn out that the Security Barrier will force the other side to use rockets, mortars and probably new, dangerously innovative weapons and tactics if they are really waging a new widespread operation. Let us hope not. But I would keep a close watch on events. Was “the window” every really open? Good point. It does seem that everyone knows what the parameters for an agreement are. While the devil, of course, is in the details, my question is: How important does one think having two states is to maintaining Israel as a democratic home to the Jewish people? I believe that if we don’t get a Palestinian state in place, it is a big risk to Israel. Therefore, I believe that Israel should be doing everything in its power to get everybody to the table. Although Bibi has made some significant progress in his personal statements, I don’t believe that the government as a whole has. They like to point to the Palestinians as the problem. They are quite right. So? What are they doing to change that? Nothing. And unfortunately the result may be more violence – only this time, Hezbollah, Hamas and the rest of the terrorists have much more sophisticated weapons than they had the last time. I only pray that I am wrong about this. Your statement, frequently quoted by the “peace camp” that “everyone knows what the parameters of an agreement are ” is the biggest myth in the Middle East. Although it sounds nice and reasonable, the wished-for outcome of “an independent democratic Palestinian state living side-by-side with Israel in peace and prosperity” never was in the cards. The very idea of it is abhorrent to the Palestinians and to the wider Arab/Muslim world. The Arabs DO NOT accept the existence of a dhimmi Jewish state in the heart of the Middle East which is. to them, Dar al-Islam–the “realm of Islam”. The Muslims fought a long-war of attrition against the Crusaders which lasted two centuries. They view the current Arab-Israeli as an exact replay, which is only 60-some years along. They are a people with a long historical memory and a clear view of their destiny as a people. The Israeli “peace camp” refuses to recognize this and instead projects their own values, and their own secular, materialist, consumerist value on the Arabs who, as a conservative, religious people largely reject these values. I am sorry if this sounds depressing, but I do not view the situation as hopeless. On the contrary, in spite of the set-backs and violence, Israel is continually growing stronger and pulling further and further ahead of the Arab world. However, instead of working for an unattainable contractual peace agreement, we need to aspire to an UNOFFICIAL modus-vivendi. The absolute prerequisite for this is for Israel to announce that THERE WILL BE NO MORE TERRITORIAL WITHDRAWALS and that the existing Jewish settlements in the West Bank be strengthened. This, of course, leaves room for agreements with the Palestinians in the economic field and hopefully the situation will arise that the Israeli security presence there can be drawn down (these unfortunate terrroist actions work to prevent that and that is the reason HAMAS and the Al-Aqsa Martyr’s Brigade carry them out….in order to prevent normalization of the lives of the Palestinians). The reason that it is vital that the settlements be strengthened and no more withdrawals be considered is because as long as Israel is withdrawing and offering concessions, the Arabs intrepret this as weakness and it leads them to say “you see, the radical Islamists are right, the Qur’an teaches that Jews are cowards and if we keep up the pressure, they will eventually run away from Tel Aviv they way they ran away from southern Lebanon and from Gush Katif”. This mindset MUST be overturned. 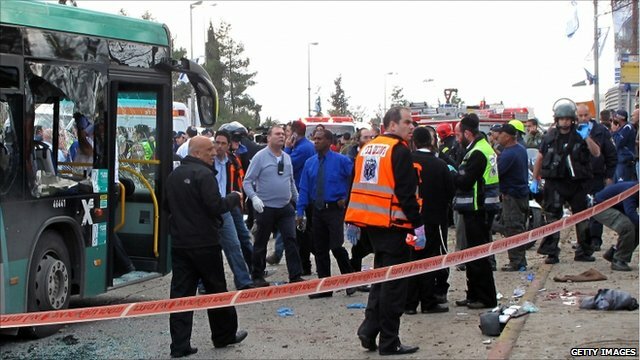 The Arabs must learn that violence only hurts them. I know that this is not what the ‘Peace camp’ is used to hearing, but they have dominated the Israeli political discourse ever since the Yom Kippur War almost 38 years ago, and they have failed miserably. The “peace process” has brought unprecendented violence and suffering to both sides. It is time for fresh thinking, and I believe what I have outlined above is the way forward.